The last round of group matches in Street Fighter left some teams playing for a place in the playoffs and other just playing for pride, but no matter the stakes, the action was intense in Week 6 of the Gfinity Elite Series Delivered by Domino’s! We began the evening with something of a dead-rubber, as exceL were already assured of their place in the semi-finals and Reason had been eliminated in Week 5. However, there was still plenty to play for as both teams took the chance to field some of their draftees. ADTerminal, Irissia and OneStepLayered lined up for exceL, with Irissia becoming the first woman to take part in the Elite Series proper having appeared two weeks before in the Mid-Season Special Event. Reason went for Boltstrike, Ki113r 7 and King Nashor as they gave some of the players a first run-out in Season 4. Boltstrike faced ADTerminal in the first game of the evening in the first of what could have been three head-to-heads as the Reason man’s Vega took on ADTerminal’s Urien. ADTerminal made the better start with a solid punish, but after jumping into his opponent, Boltstrike was able to do serious damage and take the life lead. ADTerminal activated to try and get back into the round, but good defence from Boltstrike followed by two throws allowed him to close out the round. An early whiff punish from Boltstrike put ADTerminal on the back foot, but Boltstrike was then forced to the corner, narrowly managing to avoid the stun and almost certain defeat. Despite wasting two v-triggers, ADTerminal was then able to finish the round with an EX headbutt. ADTerminal started the final round the strongest as he pushed Boltstrike to the corner and dealt out big damage to his opponent. Boltstrike managed to escape and claw his way back into the round, but after seeing out another v-trigger from ADTerminal, he missed his critical art, allowing the exceL man to take the round and put his side 1-0 up in the series. Irissia was in the hot seat for the first time as she faced Elite Series veteran Ki113r 7, with her Cammy taking on his Akuma. Ki113r 7 made the better start as he landed a kick combo, and despite a brief comeback from Irissia, he managed to close out the round with relative ease. Irissia came back well in the second round as she took the attack to Ki113r 7 to surge into a huge life lead. However, Ki113r 7 came back incredibly well, and even though both players missed chances to punish their opponent, Ki113r 7 finally managed to land the crucial blow and take the second game for Reason. King Nashor made his first appearance of Season 4 as his Laura took on OneStepLayered’s Karin. King Nashor started better as he connected with a command grab, but OneStepLayered returned fire as he threw Laura to the corner. Both sparred for superiority as the round went on, but OneStepLayered came out on top in the end as he finished off the round with a meaty throw. OneStepLayered started the better in Round 2, but two consecutive grabs from King Nashor dragged the round back for the Reason man. However, OneStepLayered put together an unstoppable combo, and his critical art finished off the round as he put exceL back in front in the series. OneStepLayered took on Ki113r 7 in the fourth game of the day, and he started the better as Karin connected with an anti-air and then threw Akuma to the corner. Ki113r 7 came back well with a few solid kicks, but an activation from OneStepLayered allowed him to put his opponent under serious pressure. Another late surge from Ki113r 7 saw him push OneStepLayered to the corner, but he then missed the v-reversal, allowing Karin to connect with a low punch to take the round. An early whiff punish put Ki113r 7 on the back foot in the second round, but he roared back into the contest with an onslaught of kicks. Ki113r 7 soon got the stun which enabled him to easily take the round inside 25 seconds. Ki113r 7 went on the attack at the start of the third round as he jumped in, catching OneStepLayered pushing buttons. The exceL man did well though as he landed a few meaty light kicks, and OneStepLayered finished the round by dashing in on Ki113r 7 when he found himself stuck in the corner. With exceL just one win away from a series victory, Boltstrike needed to do better second time around against ADTerminal, and do better he did as his Vega took control of the round to claim an early stun. However, ADTerminal fought back well to capitalise on his opponent’s poor timing, and four consecutive throws put him in the driving seat. However, Boltstrike held on and finished off ADTerminal with critical art to take the first round. ADTerminal looked in good form in the second round, and despite more solid defence from Boltstrike in the face of Urien’s activations, the exceL man closed out the round with a series of anti-air headbutts. exceL had set point going into the last round, but Boltstrike was the one with all the momentum early on as he forced ADTerminal onto the back foot with good pressure followed up with a command grab. ADTerminal was left with a huge life deficit, and after another command grab, Boltstrike was able to finish off Urien and keep Reason in the series. Ki113r 7 and OneStepLayered faced off again in the sixth match of the evening, and the exceL man had the upper hand as Ki113r 7 repeatedly misjudged Karin’s range. Ki113r 7 tried to get back into the round by forcing the issue, but after jumping in, OneStepLayered was able to pick off Akuma, giving exceL two set points. OneStepLayered showed good control in the second round as he waited for Ki113r 7 to go on the offensive. The exceL man had the complete measure of his opponent throughout the round and finished it off in style with a medium kick. The victory meant that exceL maintained their 100% record in the group stage despite switching out their regular roster, and Reason exited the Elite Series without a single win. Having slipped to his first ever defeat in the Elite Series, Phenom was keen to show that he is still the top dog in the Gfinity Esports Arena, and he was the star turn in an impressive Nordavind roster which also featured Veggey and Salty Kid. The Norwegian side needed just a losing bonus point to qualify for the semi-finals, and they would also be keen to keep up their 100% win record stretching back to Season 3. ROG Army had more to play for as they needed a win to stand any chance of making the playoffs. 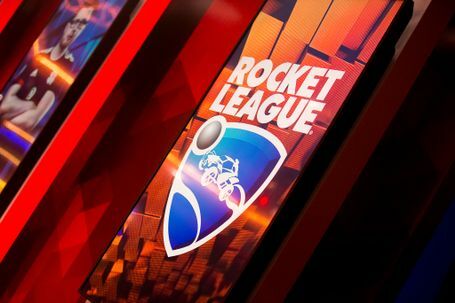 Flawless Deku, JonesArcade and Shivryuken made up their roster, and all three knew a colossal task stood in front of them in their final group stage match of the Elite Series. Phenom’s Necalli took on JonesArcade’s Ken in the first game of the series, and after a good start from the Nordavind man, JonesArcade came back well as he capitalised on a missed anti-air jab. However, after activating and forcing JonesArcade to the corner, there was only one outcome as Phenom took the first round. JonesArcade began the second round well as he used his fireball to force Phenom into the corner. An ill-advised jump in from JonesArcade then allowed Phenom to anti-air and get out of the corner, but he managed to force Necalli back to the corner and ensured not to get over-eager too soon, instead waiting for the opportunity to anti-air as Phenom tried to jump out. A throw from Ken put Phenom in trouble, and although Phenom rallied after activating, JonesArcade managed to land a hit to see out the round. Phenom started the last round quickly, and he pushed JonesArcade to the corner inside the first ten seconds. JonesArcade then made the fatal mistake of trying to jump out, and Phenom was able to get the stun and see out the round to make it 1-0 to Nordavind. Salty Kid was unbeaten in Season 4 to this point, and his R. Mika faced Flawless Deku’s Necalli in the second game of the series, with his experience of training against Phenom’s Necalli sure to be a crucial factor in the outcome of the game. The experienced shone through, as Salty Kid secured a stun inside the first 25 seconds to seal a perfect KO. The second round started similarly to the first, but Flawless Deku was finally able to land a hit as he punished a walk back from Salty Kid. Flawless Deku couldn’t string any meaningful moves together though, and after being interrupted by Salty Kid, R. Mika threw Necalli to finish off the round in impetuous style. Shivryuken faced his former team for the first time as his Menat took on Veggey’s Birdie. Menat controlled the early stages of the round with the orbs, but Veggey took advantage of a failed dash and poor activation to force Shivryuken to the corner before a crouch medium kick finished off the round. Round 2 was an even affair with both players trying to play to their strengths, and after getting hit with an overhead, Veggey found himself in trouble. Shivryuken then backthrew Veggey, and despite a late activation, an instant jab from Menat finished off the round. Veggey was up against it in the final round, and his desperation showed as he started to dash towards Shivryuken to try and disrupt his game. Despite being forced to the corner, Shivryuken controlled the space well with Menat’s orb before finishing off Veggey with an anti-air. With ROG Army targeting Veggey, the Nordavind captain was up again, this time taking on JonesArcade. The casters noted the neutral mismatch between the characters, but JonesArcade did well to string together a combo and force the stun. A good v-reversal from Veggey put JonesArcade under pressure, but there was too much for him to do and Ken saw out the round for the ROG Army man. The second round was a classic, as Veggey tried to get his form back on track against a resurgent JonesArcade. Having led for most of the round, Veggey found himself in the corner facing a devastating barrage from JonesArcade, and he couldn’t recover from there as JonesArcade closed out the second round to bring the series level at two games each. Phenom was back for Nordavind in the fifth match-up as JonesArcade hoped to continue his good form from the previous game. JonesArcade started poorly but managed to get a corner switch to put Phenom back under pressure. However, Phenom was able to weather the storm from Ken before activating and closing out the round. JonesArcade put on a great neutral display in the second round as he played a patient game against Phenom. The ROG Army man rounded off an excellent display as he dispatched of Phenom with critical art to take the game to a third round. A fast start from Phenom was dealt with commendably by JonesArcade, and after maintaining excellent spacing throughout, he walked up on Phenom to unleash a barrage of attacks. After Phenom activated, JonesArcade missed his chance to take the round, and a few throws finished off Ken to seal Nordavind’s place in the semi-final. Veggey was back for his third game of the evening as he took on Flawless Deku. ROG Army needed something from the game to stand any chance of making the playoffs, and despite Veggey’s experience of facing Phenom’s Necalli, Flawless Deku was able to see out the round as Birdie unusually tried to command grab Necalli. With Epsilon’s season on the line as well (with a losing bonus enough to see ROG Army leapfrog them in the table), Flawless Deku went on the offensive against Veggey, and with his opponent looking devoid of confidence, Flawless Deku closed out the round as he punished an attempt to activate from Birdie. Shivryuken faced Phenom in the deciding match of the series, and he started well with a big jump from Menat. Phenom fought back well as he walked into Shivryuken, and a series of command grabs was too much for Menat to handle as Phenom took the first round. Shivryuken was playing with fire in the second round as he narrowly avoided another walk up from Phenom, but he improved as the round went on, landing a nice anti-air. Phenom then activated, and one hit was all it took to shift the momentum as he finished off Shivryuken to keep up their 100% win record. Considering the head-to-head situation, Hashtag United needed at least a losing bonus point to qualify for the playoffs, whereas Fnatic were already guaranteed to finish in second place after Nordavind’s victory. Draftee Suleymon made his first start of Season 4 as took to the stage alongside Kilzyou and Shakz. Hashtag made just one change from their previous match with JokerJokez coming in for JesterPower to start alongside the ever-improving DarkMoonHado and Naught. DarkMoonHado’s Cammy took on Kilzyou’s Karin in the first game of the series, and a few solid early grabs from the Fnatic man put him in control of the round. Kilzyou then chipped away at DarkMoonHado’s health to finish off the round. Another good start from Kilzyou saw him race into another life lead after throwing DarkMoonHado. The rest of the round played out in a similar fashion to the first with Kilzyou in complete control as he claimed the first game for Fnatic. One of the surprise packages of Season 4 Naught took on Shakz in the second game in a Urien versus Laura match-up. Shakz started fast with a throw on Naught giving him the upper hand. Naught recovered well to force Shakz to the corner, and a well-timed v-trigger allowed him to seal the first round. Another bad start from Naught left him with a lot to do in the second round, and the Fnatic man claimed the stun inside the first ten seconds as Naught had no response, meaning the game went to a third and deciding round. The tide turned in Round 3 as Naught went on the early attack, but unlike Shakz in the previous round, he wasn’t quite able to get the stun. Shakz came back with three consecutive throws after forcing Naught to the corner, but Naught used his mirrors brilliantly to control the space and close out the round. Suleymon went with Zeku in a rare match-up against JokerJokez’s Ibuki, and the Fnatic man made the early moves as he forced JokerJokez to the corner. JokerJokez fought back well as he checked a slide from Suleymon to prevent his activation, and after Suleymon walked into his opponent, JokerJokez closed out the round. JokerJokez looked in good form in the second round as he raced into a big life lead. Having initially forced Suleymon to the corner, JokerJokez then found himself under pressure, and a low kick finished off Ibuki. Taking heart from his opponent’s mistakes, Suleymon went on the attack in the final round, but having forced JokerJokez to the corner, he missed the opportunity to stun. After a close round which saw JokerJokez block a critical art from Zeku, Suleymon ensured he didn’t regret the missed stun as he dispatched Ibuki with a tidy anti-air. Naught faced Suleymon in the next game, and the Hashtag man’s Urien got off to a fast start as he took a life lead early on. Suleyman came back with a series of throws, and even after he saw off Naught’s v-trigger, a throw from Naught finished off Zeku. Both players traded blows in the second round, but Naught appeared to have the upper hand after throwing his opponent and landing a few electrical attacks. Suleymon then hit back with a critical art that left Naught with no life left to play with, but despite using his v-trigger, Naught was hit with a low kick and the game went to a deciding round. Suleymon’s throwing game looked strong in the third round, but a great whiff punish from Naught put his opponent in serious trouble. Naught then activated to force Suleymon to the corner, and using his mirrors once more, the Hashtag man levelled the series at two games each. DarkMoonHado took on Shakz in the fifth match of series, and it was the Hashtag man’s Cammy who made the better start. Shakz came back with a series of decent throws, but even after activating, DarkMoonHado finished off the round with critical art. Shakz seemed to be standing off his opponent, but soon he got his usual game going as he threw his opponent twice in a row to take control of the round. The pressure told in the end, as Shakz’s Laura forced DarkMoonHado to the corner and closed out the round with another throw. The momentum built up in the previous round went out the window as Shakz made an execution error on a sunset wheel, and DarkMoonHado took full advantage of the mistake. However, an over-commit from DarkMoonHado allowed Shakz back into the round which he was able to see out to give Fnatic a 3-2 lead. DarkMoonHado had an immediate chance to make amends as he faced Suleymon in Game 6, and Hashtag’s whole season was on the line as a win for Fnatic would see them eliminated. DarkMoonHado started well and forced Suleymon to come out of his shell, and he couldn’t deal with the speed of Cammy’s attacks as a backthrow finally finished off Zeku. Suleymon started the next round more positively as he threw DarkMoonHado to the corner. However, Suleymon walked into DarkMoonHado, and the Hashtag man took full advantage, unleashing critical art too see out the round and give Hashtag the bonus point they needed to reach the semi-finals. The deciding game had an unusual feel as both teams were now assured of their place in the playoffs, but both Naught and Shakz were determined to claim the win for their team. Shakz started off with a great punish before hitting Naught with an overhead to sprint into a huge life lead, and even as Naught looked to use his mirrors to put Shakz on the back foot, the Fnatic man was patient and finished off Urien with a simple punch. An early sunset wheel have Shakz the first hit of the second round, but Naught fought back well using v-reversal. A more timely v-trigger then put Shakz under pressure, and Naught then threw Laura to finish off Shakz and take Game 7 to a third round. Shakz went on the attack again and landed a heavy sunset wheel early in the round as Urien was forced to the corner. A missed conversion gave Naught a path back into the round, but the early damage was too much to come back from and Shakz closed out the round with a bolt charge to give Fnatic the win. Two of Street Fighter’s big-hitters went head-to-head in the final match of the weekend, and the Boys In Blue knew they needed something to stay in the Elite Series, so the pressure was on Layo, Abdess and Mr Crimson to perform. 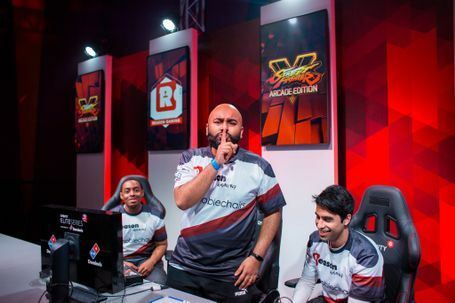 However, they wouldn’t have an easy ride, as Verdoyance and Linkexelo - along with ex-Envy man TKR - were a second-placed finish in Group A.
Abdess’s Akuma took on TKR’s Chun-Li in the first game of the series, with Abdess still to win a single round in the Elite Series to this point. Having started well, Abdess found himself under pressure after TKR unloaded v-trigger 1 to force him to the corner. The round went to the wire, but TKR just managed to close it out with Chun-Li’s instant air lightning legs. The Envy man started the second round the stronger, but a great anti-air from TKR once again helped swing the momentum towards Chun-Li. TKR then went on the attack and bided his time to finish off Abdess with a low kick to take the round for Vitality. Verdoyance’s Blanka was up for the second game as he faced Mr Crimson’s Dhalsim. The round was well fought, with Verdoyance trying to close the distance and Mr Crimson attempting to use his range to keep Blanka at arm’s length. Mr Crimson’s lack of anti-airs was his downfall in the end, as Verdoyance took the first round. The second round followed a similar pattern, and after jumping into a small life lead, Verdoyance tried to frustrate Mr Crimson into making a mistake. After Mr Crimson dragged himself back into the round, another clean jump in from Verdoyance followed by a command grab put him back in control. Having whiffed on a rolling cannon, Verdoyance still managed to close out the round to make it 2-0 to Vitality. Layo stepped up to the plate for Envy in the third game with his Laura taking on Linkexelo’s Ibuki, with the Vitality man switching from his regular main Necalli. Layo started fast with a whiff punish, but Linkexelo fought back well as he landed a few throws. Linkexelo then went on the attack with air kunai before managing to get the stun to seal the round. Having started on the back foot, a good interruption from Linkexelo shifted the momentum of the round. However, a missed read from Linkexelo after Layo activated allowed him to land a combo to get the stun and send Game 3 to a third round. Linkexelo put the pressure on Layo early in the round as he forced him to the corner, and with just 30 seconds gone in the round, he found himself with an almost insurmountable life lead. With the pressure of Layo, Linkexelo waited to Laura to make the first move before unleashing the kunai. With Envy needing a reverse sweep to stay in the series, Abdess was in the man feeling the pressure as he took on Verdoyance, with the Vitality man switching to Birdie for this match-up. Abdess went on the attack, landing a crush counter before forcing Verdoyance to the corner and getting the stun. Verdoyance briefly fought back with two punishes, but Abdess was able to see off the fight back to take the first round. With Abdess going on the attack, a crush counter standing hard kick from Verdoyance got him back into the round as Akuma took on serious damage. Despite a few more punishes from Birdie, Abdess managed to get another stun on Birdie to close out the round and seal his first victory of Season 4. TKR faced Mr Crimson in Game 5, and although Mr Crimson controlled the space well early on, TKR was able to get close with Chun-Li to inflict damage on Dhalsim. Mr Crimson played intelligently throughout, but a back throw from TKR finished him off to leave Envy on the brink of elimination. A rapid start from TKR put Mr Crimson under real pressure, but his instant air lightning legs couldn’t quite force the stun. Mr Crimson used Dhalsim’s fire breath to escape from the corner, but another series of kicks from Chun-Li sealed the victory for Vitality as Envy crashed out in the group stage. The win also meant that Method qualified for the playoffs for the first time. Don’t miss the drama of Finals Week - grab your free tickets to watch the conclusion of Street Fighter V in the Gfinity Elite Series Delivered by Domino’s now! Watch all the action next Saturday from 18:00 GMT on our site and on Facebook.